On January 4th 2016, PassageMaker broke ground on a new factory & office space in the PingDi district of Shenzhen in the summer of 2016. This new facility houses our virtual factory and virtual office clients. 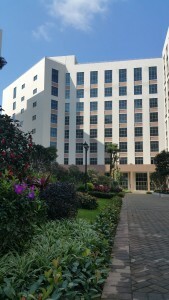 Located in Shenzhen’s only low carbon industrial zone. The facility takes advantage of solar and wind power. The first of its kind in South China! The low carbon area and greenbelt is designed to reduce pollution and provide a better environment for your staff and their families. Serviced by new 6 lane highway that connects the zone to the sea ports and airport. A trip that took 2 hours now takes 20 minutes. The new facility will meet or exceed all of PassageMaker’s current accreditations for ISO, Quality System, Workplace Safety, Environmental Protection and Social Compliance. PassageMaker’s new facility in Shenzhen’s low carbon industrial zone houses the virtual factories and virtual offices set up on behalf of our clients. Weight limit for installation of heavy equipment is 500 kilos per square meter. Weight limit for freight elevator is 2000 kilos. When installing large pieces of equipment, the facility has a removable wall panel which allows crane access to the production floor. If for some reason this particular building is not a perfect fit for your needs, know that PassageMaker can lease and customize additional facilities on your behalf in the vicinity of our existing facilities.